There are lots of opportunities for using micro-renewable technology in your shop, office, factory, warehouse or church: what you decide to go for will depend on your needs and your situation. There are various government incentives to increase uptake of renewables by businesses. The two key initiatives are the Feed In Tariff and the Renewable Heat Incentive. To be eligible for either scheme, both the equipment and installer have to be accredited under the Microgeneration Certification Scheme (MCS). It is crucial that you ensure both the technology you are using and the company / individual installing the equipment are MCS-accredited (http://www.microgenerationcertification.org), as it could mean that you aren't able to claim any incentive. Therefore, you cannot install the technology yourself if you want to achieve the maximum financial benefits. If you don't own your premises - ask your landlord whether they would consider investing in renewables. They would benefit from the financial incentives and you would benefit from reduced running costs. The UK government's Feed In Tariff (FiT) was introduced in April 2010 to support the small-scale generation of electricity from renewable sources. Anyone generating electricity is paid for every unit (kilowatt-hour; kWh) they produce, whether they sell it to the electricity grid or use it themselves. The scheme covers solar photovoltaic panels (solar PV), wind turbines, micro-hydro and anaerobic digestion. Tariff levels are banded by technology and generation capacity, which means that a smaller, domestic installation will be eligible for a higher rate than a larger, commercial development. Rates per unit are much higher than you would typically pay your energy supplier - a PV installation under 4kW retrofitted to a building will be eligible for 43.3p/kWh*. The payments are index-linked and guaranteed for 20-25 years depending on the technology. The tariff levels will reduce year-on-year, ensuring early uptake of installations. You can also receive a small payment for exporting renewable electricity. * Update: the UK Government is proposing to reduce Feed-in Tariffs for new solar PV installations as part of their comprehensive review consultation. A reduced rate of 21p/kWh for solar PV installations <4kW - tariffs will be introduced from 1 April 2012 and will affect all installations with an eligibility date on or after 12 December 2011. Keep up to date by visiting the DECC website. The Renewable Heat Incentive (RHI) is the UK government's equivalent of FiTs for micro-renewables generating heat (e.g. solar thermal panels, automated biomass boilers, ground source heat pumps and biogas). Following a long wait for details, more information was announced in March 2011. One of the reasons for the delay is the difficulty in measuring renewable heat - it's not easy to know how much heat is being generated from renewable sources. Another issue has been deciding what technologies are truly renewable. For example, heat pumps use grid electricity, but get around 3kWh of heat out for every kWh of electricity consumed. There has been a delay to the introduction of a RHI for domestic installations until October 2012. In the mean time, there is a Renewable Heat Premium to plug the gap - details of which have been recently. There is around £12m available to householders in Scotland, England and Wales who install from 1 August 2011. Suitably accredited installations for businesses - anything from a B&B to a factory - will be eligible for RHI payments when the scheme is introduced, with tariffs again variable according to technology and scale. Yet another review has caused yet another delay, but the RHI is due to get underway in early 2012. Visit the Energy Saving Trust page on the RHI for up-to-date information. The payments are more complicated than FiTs, but a 30kW biomass boiler should receive annual RHI payments of around £3,000 for 20 years. One of the reasons that the RHI has been initiated for non-domestic installations is that the heat will need to be measured using heat meters, which will be difficult for a technology installed in a home. See this website for useful information on the RHI (but bear in mind that it's not a site affiliated with DECC or EST). There is a table of likely tariff levels although it has not started yet. Installations after July 2009 qualify so if you install an accredited technology now it should still be eligible. Solar hot water panels cost about £4000 and should produce about 2,500 - 3000 kWh of heat for a commercial premises that is using hot water during the day. Solar hot water is due to get a tariff of 8.5p per kWh. If you add this to the cost of the energy you save they should pay back in about 5-6 years up here but the payments will carry on for 20 and the panels have been known to work for 40 years as they have few things to go wrong. Looks like a good investment. The most suitable technology for your business will depend on i) when you need energy, ii) the type of energy you most need and iii) the situation of your premises. This means that it is difficult to make recommendations. However, we at Keep The Heat In may be stepping out on a limb, but we think that there's a good chance that solar PV could be a viable technology for your business. I know, we don't know anything about your building or where you are, but hear us out! Solar PV is expensive to install - around £3k-£4k per kW of output - but the maintenance costs are minimal. Now that FiTs provide a higher level of return, payback is relatively predictable. This makes solar PV a sound investment. A relatively small solar PV array with a maximum output of 2.5 kW on an unshaded south-facing roof of a warehouse would cost around £8-10,000 to install. In one year, such an installation should produce around 2,000kWh of green electricity. Assuming that half of electricity is used on site as it's produced and half is exported to the grid, the installation would expect to receive FiT payments of around £900 a year (at 43.1p tariff level*). There will also be savings of perhaps £150 on the electricity bill. The FiT tariff is index-linked, so it will increase with inflation, and the savings in purchased electricity will be higher in the future as energy prices rise. Larger installations will be cheaper per kW installed but the level of feed in tariff reduces above 4kW (£12-15,000) and again above 10kW. See this price guide and feed in tariffs calculator for one company that we know about but its worth getting at least three quotes. The Centre For Alternative Technology's calculator is also excellent (info.cat.org.uk). It is important that the panels are orientated roughly south and on a suitable slope of around 35 degrees, although they can be mounted on a flat roof or even a south facing wall. They still work on east or west facing roofs but payback time will be longer as they won't generate quite as much electricity (maybe eight years rather than seven). The array should also be sited away from shading (e.g. overhanging trees). However, many businesses would be especially suitable for solar PV because most of their energy consumption is during the day. A high level of lighting is often required, so virtually all of the electricity generated will be used on site. This means that the savings on electricity purchased from the grid will be even higher than the above example. The efficiency of the panels does reduce over time, but the efficiency reduces only a small amount even after 20-25 years and some early models are still going strong after 40 years. It is possible that biomass may be a viable technology for your business, particularly with the new RHI payments. As much of our area is off the gas network, many of us are dependent on more expensive and more polluting fuels (e.g. off-peak electricity, oil and LPG). Biomass is emerging as a viable alternative, with running costs close to mains gas and an expanding supply chain. The most common form of biomass is the humble log, which cost around £50-£100 a tonne. However, they are not well-suited to automated systems. Wood chips and pellets can be delivered and fed into a hopper. Wood pellets cost around £200-£250 a tonne and chips are usually cheaper. However, chips require more careful storage to avoid degradation and contracted supplies. Biomass is a much more sustainable alternative to fossil fuels, particularly as we have plenty of forestry plantations in the Highlands. Pellets provide a 91% saving in carbon emissions compared to oil and a 95% saving compared to grid electricity. If you're thinking about replacing an ageing LPG or oil boiler, please investigate the suitability of a woodfuel system for your premises. 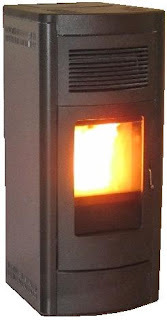 You can even get standalone pellet stoves, which provide direct room heating for your premises. Simplest of all is a wood-burning stove. Open fires only put a small proportion of their heat into a room, so consider installing a stove in the fireplace. Another option for renewable heating are ground-source or air-source heat pumps. They act like a fridge in reverse, using electricity to extract heat from the ground or the air and pump it around a central heating system. A heat pump is more likely to be a viable choice for your business if you live in a well-insulated or new-build property away from the mains gas network. Heat pumps produce a low grade heat, so they are better suited to underfloor heating systems. A key issue is the coefficient of performance (CoP) - the higher the CoP, the more heat energy output per unit of electricity consumed. With the market for this new technology expanding, the Energy Saving Trust conducted a field trial of heat pumps. The report is well worth reading through if you are considering installing a heat pump. It demonstrated that performance very much depends on proper installation, integration with existing heating systems and correct use. - www.microgenerationcertification.org - official site for MCS scheme, including up-to-date lists of accredited installers and products. - info.cat.org.uk - information service for the Centre for Alternative Technology in Wales, up-to-date, detailed advice and easy to navigate (including an excellent calculator for solar PV). - www.energysavingtrust.org.uk/scotland - follow this link to the renewables section of the Energy Saving Trust website (remember that the local Energy Saving Scotland advice centre in Inverness can give free advice and that zero-interest energy efficiency loans are available). - www.usegreenheat.co.uk - an organisation in the Highlands promoting renewable heat (woodfuel, heat pumps and solar thermal). - www.coedcymru.org.uk/calculator - a FANTASTIC schematic for calculating and comparing costs for heating with woodfuel versus electricity, gas, oil, LPG and anthracite - very useful! - Drumsmittal Renewables - site showcasing the renewables installed at our co-ordinator's home in North Kessock. Remember to have a look at our pages on lighting, refrigeration, energy monitors and low-cost energy efficiency measures.